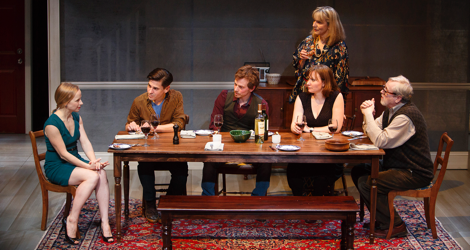 Canadian Stage is currently giving Tribes (2010) by British playwright Nina Raine its Canadian premiere. Though the play has been highly acclaimed elsewhere, this is a case where interest in the subject matter of the play has distracted audiences from its ramshackle construction. The play raises the topic of how deaf people perceive the world and a hearing audience will find this fascinating. As drama, however, the play fractures into numerous plot lines that go nowhere. The story concerns a Jewish family in England who has raised its one deaf child, Billy (Stephen Drabicki) to lipread rather than sign. In a volatile family of argumentative, self-obsessed people, Billy, his deafness apart, stands out as the most normal person. At a cultural event for deaf people, Billy meets and immediately falls in love with Sylvia (Holly Lewis), a young hearing woman raised by deaf parents. In contrast to Billy, she has been brought up to sign and not lipread. She is troubled by the fact that she is now gradually losing her hearing. Eventually, Billy summons up the courage to introduce Sylvia to his family and they immediately pounce on her with a battery of questions about what it is like to be deaf. By the end of Act 1, we think the play will about whether Sylvia does or does not manage to fit into Billy’s family. This doesn’t happen. The family for all their aggressiveness, likes her. Instead, Raine has Billy get a job as a professional lipreader for court trials and has him investigated for adding too much of his own material to his transcriptions. Billy’s unstable brother Daniel (Dylan Trowbridge) is attracted to Sylvia to the point of kissing her, but, contrary to expectations, this leads nowhere. Daniel has also gone off his meds and descends to the stage of having auditory hallucinations. He has done so supposedly because Billy has left home. His initial condition is a mystery, why the family is unconcerned about his hearing voices is a mystery and why Raine thinks we should feel sympathy for someone who has brought about the recurrence of his psychological dysfunction is also a mystery. With no preparation of any kind, Raine has Billy launch into a tirade where he threatens to disown his family unless they learn to sign. Yet, after the initial blowup, Raine does not fully pursue even this plot development. It is difficult for director Daryl Cloran and his cast to disguise the fact that Raine has created her characters to explore her themes rather than to explore them as characters. The linking of the deaf lipreading Billy to the hearing signing Sylvia is the most obvious example of Raine’s schematization. Billy’s undercharacterized sister Ruth (Patricia Fagan) is an opera singer trying to find her “voice”. Billy’s mother Beth (Nancy Palk) is a writer working on a “marital breakdown detective novel” who thinks herself into her characters’ heads. Meanwhile, mentally ill Daniel hears the voices of his family in his head. Daniel, working on a Ph.D. thesis about language, is a follower of Jacques Lacan (1901-81) and believes that speech is symbolic and has no positive existence. Billy’s father Christopher (Joseph Ziegler) is already an authority on language who believes in the Sapir-Whorf hypothesis that people cannot experience things for which they do not have a word. Raine thus sets up a forum for much debate about whether signing is a less or more expressive means of communication than speech and whether deaf culture is too inward-looking. Through Sylvia, Raine gives us insight into the anguish of each stage of losing hearing. Raine communicates most of this information through the simple method of question and answer when Sylvia visits Billy’s family. From a dramatic point of view it is upsetting that Billy does not stop his family from badgering Sylvia with such a barrage of questions. Raine, however, needs such overlong questioning to cover all the points she wants to make about language and hearing. The only fully rounded characters of Raine’s six are Sylvia and Billy. Holly Lewis gives a superb performance of someone whose basic nature of inward strength that belies her outward fragility is being undermined by her growing hearing loss. The empathy she generates makes us feel the point keenly that Sylvia makes that it is better to be born deaf than to go deaf since in going deaf a person is all too aware of what is being lost. As an actor who has learned sign, she shows how beautiful sign can be in the hands, literally, of a creative person. Stephen Drabicki, a hard-of-hearing actor, gives us a powerful portrait of a young man who moves from apparent meekness within his family sphere to independence and defiance. His denunciation of his family, done entirely in sign and translated by Sylvia, is the most eloquent demonstration in the play how expressive sign can be. The other four characters are sketches more than characters and the actors do their best to fill them out. Patricia Fagan’s character is the least developed. We mostly see her fending off pointless attacks from Daniel, but who she is as a person Raine leaves unclear. Fagan suggests that after Billy, she is the one with the most common sense in the family and is the weariest of its constant bickering. Beth is also underdeveloped, again because she is primarily placed in a defensive position. Nancy Palk, therefore, makes the most of those moments when Beth expresses her own opinions. What emerges a a quirky, humorous new-agey mother who believes her inner creativity will help fend off old age. Christopher, in contrast, suffers from being placed almost entirely in the position of a giver of offence. It’s possible that Raine intended his unrelenting attacks on his family and their friends as curmudgeonly, but Joseph Ziegler delivers his lines with such ferocity that if there is any endearing side to Christopher’s nature it is lost. Dylan Trowbridge has to cope with playing Daniel, the most confusing character of the six. Raine gives him little to work with. Why Daniel depends so much on Billy for his stability is never clear. They have only recently been living in the same house again. Why he makes a pass at Sylvia is not clear. Why he deliberately goes off his meds when he so obviously needs them to function is also not clear. Trowbridge deals with all these inconsistencies by making Daniel appear mentally unstable from the start, even when he is on his meds. While Raine gives us no information about Daniel’s recent breakup with his girlfriend, Trowbridge suggests that it is the breakup that has sent Daniel into a downward spiral more profound than his family can comprehend. Lorenzo Savoini has designed a plain but attractive set whose plainness serve the purpose of providing clear surfaces for his projects. He first uses projections when the dining table is uprighted and cleverly becomes the loo door outside of which Billy and Sylvia meet, their conversation over the noise projected on the door as surtitles. From then on sign or the garbled speech of Billy or Daniel is translated on the back wall of the set, where occasionally important words are picked out and to glow or fade. There is no doubt that Tribes helps open a window onto a realm that the hearing know little about, and for many these insights will outweigh the play’s deficiencies. Those looking for a satisfying evening of theatre, however, will find that Raine merely raises a host of issues without exploring them, allows the play’s second act to fly off in too many directions and ends with a conclusion that leaves too many strands of the story untied. The fact that the play has been so well acted and directed tends only to point out the flaws in the text itself. This review is a Stage Door exclusive. Photos: (from top) Holly Lewis, Stephen Drabicki, Dylan Trowbridge, Patricia Fagan, Nancy Palk and Joseph Ziegler; Stephen Drabicki and Holly Lewis. ©2014 David Hou.